James Parnell was born in 1636 and was baptised on the the sixth day of September in St.Swithin’s church, East Retford, the son of Thomas and Sarah. His parents were well-to-do, God-fearing people, and James was sent to to King Edward VI Grammar School in the town. At the age of 15 (so he recounts in his biography) he became concerned about his soul and finding, it is said, no satisfaction from the priests in Retford, he left home to travel among the many religious sects that met secretly to avoid persecution. At Balby he came across a group that “waited together in silence to become instruments in the hand of the Lord” a group which were the forerunners of the Society of Friends or ‘Quakers’. At the age of only 16 he tramped the 150 lonely and dangerous miles from Nottinghamshire to Carlisle to meet George Fox, founder of the Quaker movement, who was then incarcerated in Carlisle jail. Little is known of their encounter, but Parnell came away fully committed to the Quaker cause. He began travelling south, spreading the word to all who would listen. His direct challenge to the church led to several clashes with the authorities. In the summer of 1655 he reached northeast Essex, where he visited several towns. At Colchester he preached in St Nicholas Church - the first to preach the new faith - and spent a week in discussion and argument. Many were converted and Colchester later became a stronghold of Quakerism. Today there is a street named after him in the town. In 17th century England Dissenters from the established church risked persecution and imprisonment. 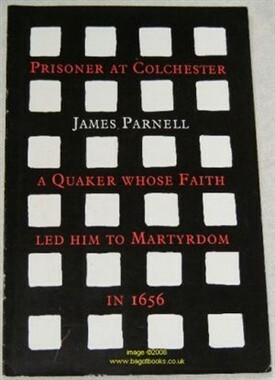 Parnell was arrested on Sunday 4th July 1655 as he walked through Colchester after a church service and charged with blasphemy and other offences. 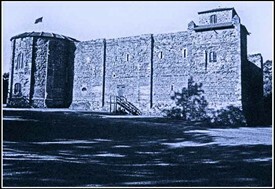 He was taken to the county jail in ColchesterCastle. He was thus returned to prison where the gaoler was known for his cruel, corrupt and vindictive ways. 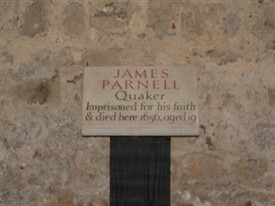 Conditions in Parnell's cell were terrible, and the efforts of local Quakers to help were barred. It is said that Parnell was forced to climb a rope reach his food, and after some months his health began to fail, worsened by injuries from a fall. By the spring of 1656 he had become weak and for ten days he could take no food. By the morning of 10 April he had died. He was buried in an unmarked grave in the grounds of Colchester Castle. A plaque commemorating his life has been placed in the cell where he died. His name was subsequently told to children all over the world by members of the Society of Friends, among whom he is ‘the boy martyr’, the first to die for their faith. This page was added by Rewind Retford on 16/02/2013. Hi, not so much a query about Quakerism in Retford, but about the Pilgrim fathers. Of the 102 passengers on the 'Mayflower', 29 were female and at least one of these gave birth during the crossing from England. I' trying to research these 'Pilgrim Mothers'. Can anyone offer information?